This past summer I came into possession of my grandfather's 15 Kodak photo slide trays. They were neatly boxed, though collecting dust, in the closet beneath the stairs at a family owned cabin in Grayling, Michigan. They had been there for at least a couple of decades. For some reason this was the summer I decided to pull them out and take a look. As I started to view these slides, with only a magnifying glass and some harsh fluorescent light, I quickly became transfixed. I knew there were images here that needed to be preserved and shared. I had a new project. Here is one of the first slides that really grabbed my attention. Taken in 1970, this particular Kodachrome photo slide is not particularly old. It shows my great grandmother, Alma (Ratz) Hanley (1894-1979), and a my great uncle (by marriage), Walter Berchulc (1918-2004), affectionately known as "Uncle Wally". Alma is from my father's side and Wally is from my mother's side. So, this is a pairing that I would have never predicted to be captured in such a clear, vibrant, and dynamic photograph. And, it was likely an image that hasn't been seen by anyone in my family for over 40 years. Until I found and shared it. I hope this inspires you to find and archive any old Kodachrome or other brand photo slides that you or your family might have lying around. By no means exhaustive, here are 6 tips that I would like to share about my Kodachrome photo slide archiving project. Determining when your photo slides were taken will help your genealogical searches tremendously. Here is a wonderful and handy chart that will help you date your Kodachrome slides. 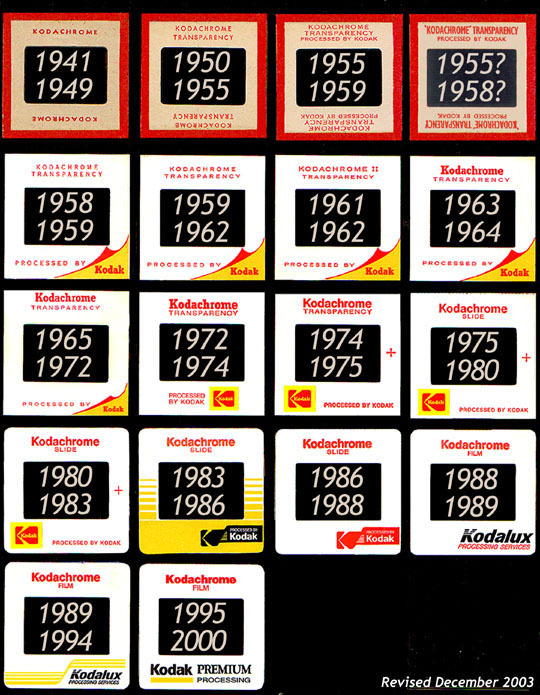 There were many other brands of slide, of course, but Kodachrome was probably the most popular. The original Kodachrome Slide Mount Chart was published here. You COULD send all of your photo slides away to a professional or mail order transferring service, but I don't recommend it. Here are some reasons why I recommend doing it yourself. It is fun and there is only a small learning curve. You will have better control over image quality and cropping. A professional might not care that Uncle Wally was partially cropped out of a photo. But, as a genealogist you want to preserve every clue! 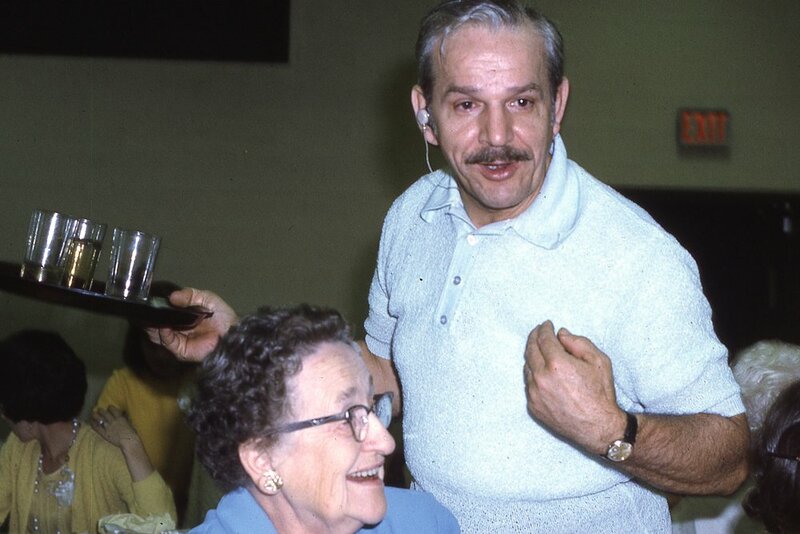 You will learn TONS more about your family if you spend a couple of hours scanning 140 slides. To do this yourself you'll need a photo scanner capable of digitizing film. There are several options to choose from. I chose the Epson Perfection V600 Photo Scanner. Though not cheap at around $200, there were several others that were 4 times the price. 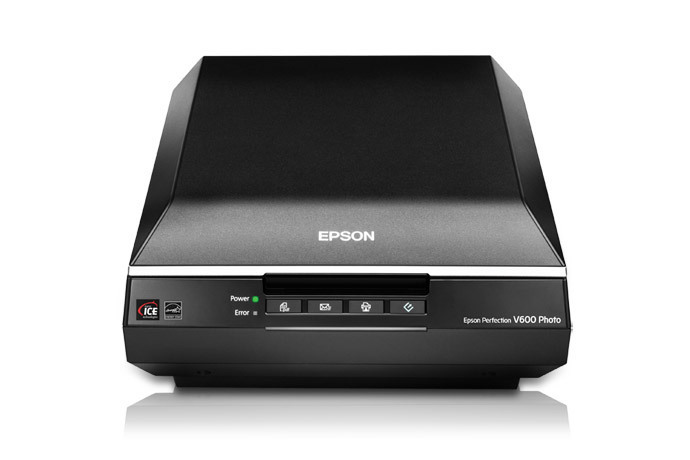 While a cheaper one may work just fine for you, I liked the options that the Epson V600 had to offer. This particular scanner can handle regular photographs, documents, positive film (like Kodachrome slides), negatives, and medium format film. Most all in one printer/scanner/copiers don't have this capacity. Okay, you probably don't really need this, but for less than 10 bucks it is handy little tool. 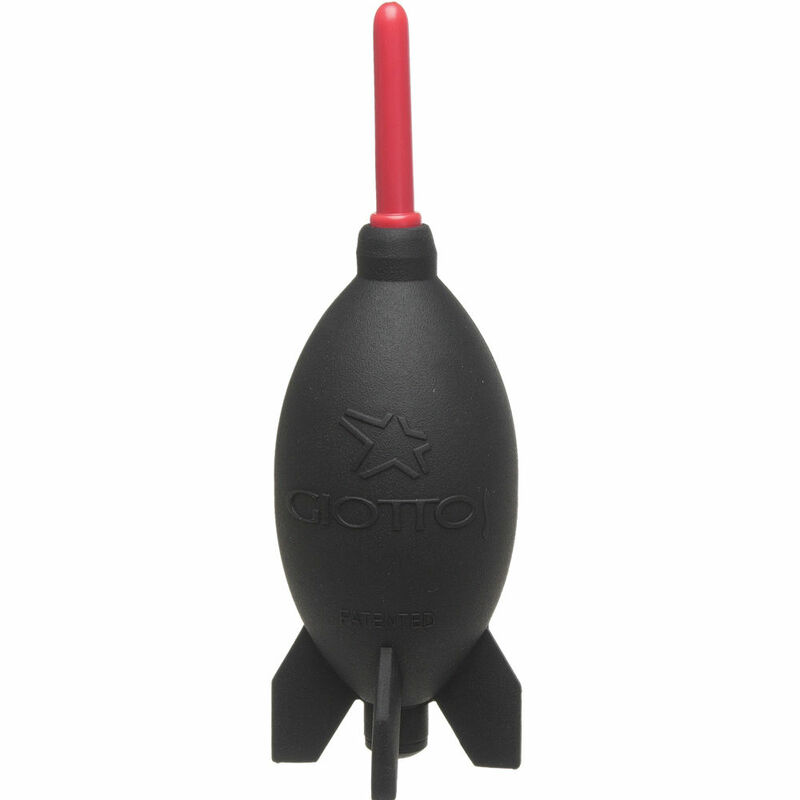 The Giottos Rocket Blaster Dust-Removal Tool (yes, you read that right) will help clear your Kodachrome and other photo slides from minor dust and debris before scanning. Most of the slides in my grandfather's collection were stored well and remained in very good condition. You will also want to get yourself a lint free microfiber cleaning cloth (the kind you might clean a camera lens with). This can be helpful in cleaning off smudges you might get in the scanner surface. Keep slides in the order they were in the trays. This may seem obvious, but it is important. Not only are you capturing images, but you are also capturing and preserving how your ancestors organized those images. You might learn something about your family by the way photos were organized, or not organized. Label digital slide images with something that will remind you of their origin. The labeling system I came up with for my grandfather's slides was, for example, "Cabin_Tray_A_001". This tells me the image is the first (001) in Tray A from the Cabin. This may not mean anything to anyone 50 years from now, but at least it will oriented you to where you got the images in the first place. Slide trays are bulky, but if you have a place to store them, try to do so. Once scanned you can box them up, preferably in a plastic container, and stick them in the basement somewhere. There is a good chance you will never need them again, until the very moment you throw them away. I admit, I could do better here. So, do as I say, not as I do. Currently I've been storying all of my photos on Apple's iCloud service. This provides ample and convenient storage space for a nominal annual fee. Other services such as Dropbox can work just as well. What I (and you) should also be doing is storing the digital photos in two other places as back ups. You should have all files stored locally on a home or laptop computer. And, from time to time, images should be backed up on an external device such as a thumb drive or disc. If for some reason you lose all three God might be trying to tell you something. Create a private Facebook group where you can post family photos. Don't overwhelm your viewers with 10,000 photos in one post. Start with a few at first and spread them out over time. Create on online photo sharing album such as can be done on Flickr.com. For example, I created an album of my great grandmother's, Ida (Rhoads) Sears (1900-2002), photo album and posted it here. This could easily be done with scanned photo slides as well. Don't underestimate the importance of printing some of your photos. They make excellent gifts for family, whether individually or in albums. I opt for a professional online printer such as Nations Photo Lab over the corner drugstore. It might cost you a little more but if it is worthy doing, it is worth doing well. There you have it! Some reasonable advice tested by yours truly. This system of dating, preserving, and sharing treasured Kodachrome family photo slides has served me well. I hope it does you too. Many of you who follow my blog know that I love finding and sharing non family related photo slides as well. The images are stunning and I think deserve to be shared with a wider audience. I will leave you with a few of my favorites that i have found in the last several months. 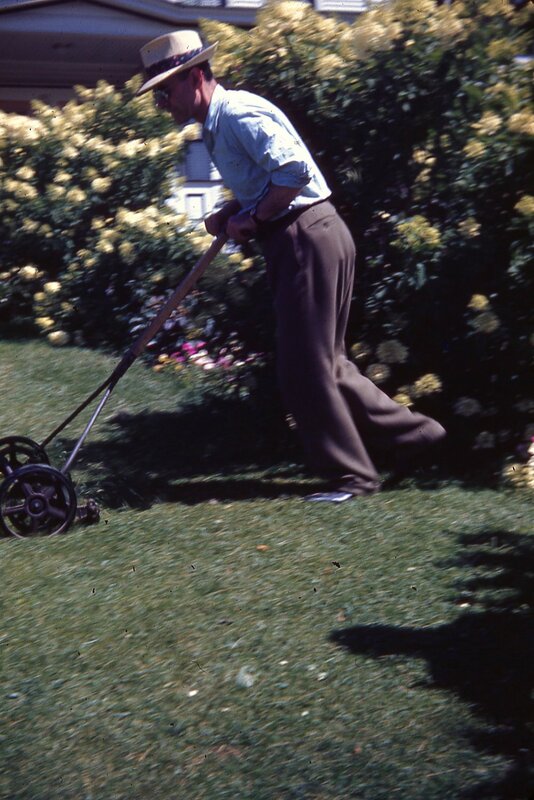 Here is one of the earliest Kodachrome slides that I have, dated sometime between 1941-1949 using the above chart. I adore this one. You've seen it before as The Psychogenealogist Pic of the Week (#41). It is from the early to mid 1950s.